In the prokaryotes, all the intracellular water-soluble components (proteins, DNA and metabolites) are located together in the cytoplasm enclosed by the cell membrane, rather than in separate cellular compartments. Bacteria, however, do possess protein-based bacterial microcompartments, which are thought to act as primitive organelles enclosed in protein shells. Some prokaryotes, such as cyanobacteria, may form large colonies. Others, such as myxobacteria, have multicellular stages in their life cycles. The division between prokaryotes and eukaryotes was firmly established by the microbiologists Roger Stanier and C. B. van Niel in their 1962 paper The concept of a bacterium (though spelled procaryote and eucaryote there). That paper cites Édouard Chatton's 1937 book Titres et Travaux Scientifiques for using those terms and recognizing the distinction. One reason for this classification was so that what was then often called blue-green algae (now called cyanobacteria) would not be classified as plants but grouped with bacteria. Long, whip-like protrusion that aids cellular locomotion used by both gram positive and gram negative organisms. Area of the cytoplasm that contains the prokaryote's single DNA molecule. It contains the inclusion bodies like ribosomes and larger masses scattered in the cytoplasmic matrix. Prokaryotes live in nearly all environments on Earth. Some archaea and bacteria are extremophiles, thriving in harsh conditions, such as high temperatures (thermophiles) or high salinity (halophiles). Many archaea grow as plankton in the oceans. Symbiotic prokaryotes live in or on the bodies of other organisms, including humans. In 1977, Carl Woese proposed dividing prokaryotes into the Bacteria and Archaea (originally Eubacteria and Archaebacteria) because of the major differences in the structure and genetics between the two groups of organisms. Archaea were originally thought to be extremophiles, living only in inhospitable conditions such as extremes of temperature, pH, and radiation but have since been found in all types of habitats. The resulting arrangement of Eukaryota (also called "Eucarya"), Bacteria, and Archaea is called the three-domain system, replacing the traditional two-empire system. Diagram of the origin of life with the Eukaryotes appearing early, not derived from Prokaryotes, as proposed by Richard Egel in 2012. This view, one of many on the relative positions of Prokaryotes and Eukaryotes, implies that the universal common ancestor was relatively large and complex. The genome in a prokaryote is held within a DNA/protein complex in the cytosol called the nucleoid, which lacks a nuclear envelope. The complex contains a single, cyclic, double-stranded molecule of stable chromosomal DNA, in contrast to the multiple linear, compact, highly organized chromosomes found in eukaryotic cells. In addition, many important genes of prokaryotes are stored in separate circular DNA structures called plasmids. Like Eukaryotes, prokaryotes may partially duplicate genetic material, and can have a haploid chromosomal composition that is partially replicated, a condition known as merodiploidy. Phylogenetic tree showing the diversity of prokaryote. This 2018 proposal shows eukaryotes emerging from the archaean asgard group which represents a modern version of the eocyte hypothesis. Unlike earlier assumptions, the division between bacteria and the rest is the most important difference beteen organisms. There is increasing evidence that the roots of the eukaryotes are to be found in (or at least next by) the archaean asgard group, perhaps Heimdallarchaeota (an idea which is a modern version of the 1984 eocyte hypothesis, eocytes being an old synonym for crenarchaeota, a taxon to be found nearby the then unknown asgard group) For example, histones usually packaging DNA in eukarotic nuclei, have also been found in several archaean groups, giving evidence for homology. This idea might clarify the mysterious predecessor of eukaryotic cells (eucytes) which engulfed an alphaproteobacterium forming the first eucyte (LECA, last eukaryotic common ancestor) according to endosymbiotic theory. There might have been some additional support by viruses, called viral eukaryogenesis. The non-bacterial group comprising archaea and eukaryota has been called Neomura by Thomas Cavalier-Smith in 2002. However, in a cladistic view eukaryota are archaea in the same sense as birds are dinosaurs because they evolved from the therapsid dinosaur group. In contrast, archaea without eukaryota appear to be a paraphyletic group, just like dinosaurs without birds. 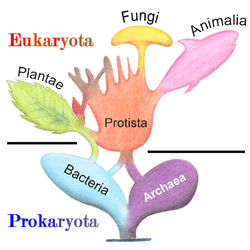 Unlike the above assumption of a fundamental split between prokaryotes and eukaryotes, the most important difference between biota may be the division between bacteria and the rest (archaea and eukaryota). For instance, DNA replication differs fundamentally between bacteria and archaea (including that in eukaryotic nuclei), and it may not be homologous between these two groups. Moreover, ATP synthase, though common (homologous) in all organisms, differs greatly between bacteria (including eukaryotic organelles such as mitochondria and chloroplasts) and the archaea/eukaryote nucleus group. The last common antecessor of all life (called LUCA, last universal common antecessor) should have posessed an early version of this protein complex. As ATP synthase is obligate membrane bound, this supports the assumption that LUCA was a cellular organism. The RNA world hypothesis might clarify this scenario, as LUCA might have been a ribocyte (also called ribocell) lacking DNA, but with an RNA genome built by ribosomes as primordial self-replicating entities. A Peptide-RNA world (also called RNP world) hypothesis has been proposed based on the idea that oligopeptides may have been built together with primordial nucleic acids at the same time, which also supports the concept of a ribocyte as LUCA. The feature of DNA as the material base of the genome might have then been adopted separately in bacteria and in archaea (and later eukaryote nuclei), presumably by help of some viruses (possibly retroviruses as they could reverse transcribe RNA to DNA). As a result, prokaryota comprising bacteria and archaea may also be polyphyletic. ^ Coté G, De Tullio M (2010). "Beyond Prokaryotes and Eukaryotes: Planctomycetes and Cell Organization". Nature. ^ Kerfeld CA, Sawaya MR, Tanaka S, Nguyen CV, Phillips M, Beeby M, Yeates TO (August 2005). "Protein structures forming the shell of primitive bacterial organelles". Science. 309 (5736): 936–8. Bibcode:2005Sci...309..936K. CiteSeerX 10.1.1.1026.896. doi:10.1126/science.1113397. PMID 16081736. ^ Murat D, Byrne M & Komeili A (October 2010). "Cell biology of prokaryotic organelles". Cold Spring Harbor Perspectives in Biology. 2 (10): a000422. doi:10.1101/cshperspect.a000422. PMC 2944366. PMID 20739411. ^ Kaiser D (October 2003). "Coupling cell movement to multicellular development in myxobacteria". Nature Reviews. Microbiology. 1 (1): 45–54. doi:10.1038/nrmicro733. PMID 15040179. ^ Sung KH, Song HK (July 22, 2014). "Insights into the molecular evolution of HslU ATPase through biochemical and mutational analyses". PLOS One. 9 (7): e103027. Bibcode:2014PLoSO...9j3027S. doi:10.1371/journal.pone.0103027. PMC 4106860. PMID 25050622. ^ Stanier, R. Y.; van Niel, C. B. (1962). "The concept of a bacterium". Archiv für Mikrobiologie. 42: 17–35. doi:10.1007/BF00425185. PMID 13916221. ^ Bauman RW, Tizard IR, Machunis-Masouka E (2006). Microbiology. San Francisco: Pearson Benjamin Cummings. ISBN 978-0-8053-7693-7. ^ Stoeckenius W (October 1981). "Walsby's square bacterium: fine structure of an orthogonal procaryote". Journal of Bacteriology. 148 (1): 352–60. PMC 216199. PMID 7287626. ^ Chen I, Dubnau D (March 2004). "DNA uptake during bacterial transformation". Nature Reviews. Microbiology. 2 (3): 241–9. doi:10.1038/nrmicro844. PMID 15083159. ^ Solomon JM, Grossman AD (April 1996). "Who's competent and when: regulation of natural genetic competence in bacteria". Trends in Genetics. 12 (4): 150–5. doi:10.1016/0168-9525(96)10014-7. PMID 8901420. ^ Rosenshine I, Tchelet R, Mevarech M (September 1989). "The mechanism of DNA transfer in the mating system of an archaebacterium". Science. 245 (4924): 1387–9. Bibcode:1989Sci...245.1387R. doi:10.1126/science.2818746. PMID 2818746. ^ Fröls S, Ajon M, Wagner M, Teichmann D, Zolghadr B, Folea M, Boekema EJ, Driessen AJ, Schleper C, Albers SV (November 2008). "UV-inducible cellular aggregation of the hyperthermophilic archaeon Sulfolobus solfataricus is mediated by pili formation". Molecular Microbiology. 70 (4): 938–52. doi:10.1111/j.1365-2958.2008.06459.x. PMID 18990182. ^ Madigan T (2012). Brock biology of microorganisms (13th ed.). San Francisco: Benjamin Cummings. ISBN 9780321649638. ^ William Costerton, J. (2007). "Direct Observations". The Biofilm Primer. Springer Series on Biofilms. 1. pp. 3–4. doi:10.1007/978-3-540-68022-2_2. ISBN 978-3-540-68021-5. ^ Costerton JW, Lewandowski Z, Caldwell DE, Korber DR, Lappin-Scott HM (October 1995). "Microbial biofilms". Annual Review of Microbiology. 49: 711–45. doi:10.1146/annurev.mi.49.100195.003431. PMID 8561477. ^ Shapiro JA (1998). "Thinking about bacterial populations as multicellular organisms" (PDF). Annual Review of Microbiology. 52: 81–104. doi:10.1146/annurev.micro.52.1.81. PMID 9891794. Archived from the original (PDF) on 2011-07-17. ^ Chua SL, Liu Y, Yam JK, Chen Y, Vejborg RM, Tan BG, Kjelleberg S, Tolker-Nielsen T, Givskov M, Yang L (July 2014). "Dispersed cells represent a distinct stage in the transition from bacterial biofilm to planktonic lifestyles". Nature Communications. 5: 4462. Bibcode:2014NatCo...5E4462C. doi:10.1038/ncomms5462. PMID 25042103. ^ Hamilton WD (July 1964). "The genetical evolution of social behaviour. II". Journal of Theoretical Biology. 7 (1): 17–52. doi:10.1016/0022-5193(64)90039-6. PMID 5875340. ^ Balaban N, Ren D, Givskov M, Rasmussen TB (2008). "Introduction". Control of Biofilm Infections by Signal Manipulation. Springer Series on Biofilms. 2. pp. 1–11. doi:10.1007/7142_2007_006. ISBN 978-3-540-73852-7. ^ Costerton JW, Stewart PS, Greenberg EP (May 1999). "Bacterial biofilms: a common cause of persistent infections". Science. 284 (5418): 1318–22. Bibcode:1999Sci...284.1318C. doi:10.1126/science.284.5418.1318. PMID 10334980. ^ C.Michael Hogan. 2010. Extremophile, Encyclopedia of Earth, National Council of Science & the Environment, eds. Monosson, E.; Cleveland, C.
^ Woese CR (March 1994). "There must be a prokaryote somewhere: microbiology's search for itself". Microbiological Reviews. 58 (1): 1–9. PMC 372949. PMID 8177167. ^ Sapp J (June 2005). "The prokaryote-eukaryote dichotomy: meanings and mythology". Microbiology and Molecular Biology Reviews. 69 (2): 292–305. doi:10.1128/MMBR.69.2.292-305.2005. PMC 1197417. PMID 15944457. ^ Brown JR (February 2003). "Ancient horizontal gene transfer". Nature Reviews. Genetics. 4 (2): 121–32. doi:10.1038/nrg1000. PMID 12560809. ^ Forterre P, Philippe H (October 1999). "Where is the root of the universal tree of life?". BioEssays. 21 (10): 871–9. doi:10.1002/(SICI)1521-1878(199910)21:10<871::AID-BIES10>3.0.CO;2-Q. PMID 10497338. ^ Poole A, Jeffares D, Penny D (October 1999). "Early evolution: prokaryotes, the new kids on the block". BioEssays. 21 (10): 880–9. doi:10.1002/(SICI)1521-1878(199910)21:10<880::AID-BIES11>3.0.CO;2-P. PMID 10497339. ^ Woese C (June 1998). "The universal ancestor". Proceedings of the National Academy of Sciences of the United States of America. 95 (12): 6854–9. Bibcode:1998PNAS...95.6854W. doi:10.1073/pnas.95.12.6854. PMC 22660. PMID 9618502. ^ McSween HY (July 1997). "Evidence for life in a martian meteorite?". GSA Today. 7 (7): 1–7. PMID 11541665. ^ McKay DS, Gibson EK, Thomas-Keprta KL, Vali H, Romanek CS, Clemett SJ, Chillier XD, Maechling CR, Zare RN (August 1996). "Search for past life on Mars: possible relic biogenic activity in martian meteorite ALH84001". Science. 273 (5277): 924–30. Bibcode:1996Sci...273..924M. doi:10.1126/science.273.5277.924. PMID 8688069. ^ Crenson M (2006-08-06). "After 10 years, few believe life on Mars". Associated Press (on space.com]). Retrieved 2006-08-06. ^ Scott ER (February 1999). "Origin of carbonate-magnetite-sulfide assemblages in Martian meteorite ALH84001". Journal of Geophysical Research. 104 (E2): 3803–13. Bibcode:1999JGR...104.3803S. doi:10.1029/1998JE900034. PMID 11542931. ^ Johnston, C; Caymaris, S; Zomer, A; Bootsma, HJ; Prudhomme, M; Granadel, C; Hermans, PW; Polard, P; Martin, B; Claverys, JP (2013). "Natural genetic transformation generates a population of merodiploids in Streptococcus pneumoniae". PLOS Genetics. 9 (9): e1003819. doi:10.1371/journal.pgen.1003819. PMC 3784515. PMID 24086154. ^ Michie KA, Löwe J (2006). "Dynamic filaments of the bacterial cytoskeleton" (PDF). Annual Review of Biochemistry. 75: 467–92. doi:10.1146/annurev.biochem.75.103004.142452. PMID 16756499. Archived from the original (PDF) on November 17, 2006. ^ Fuerst JA (2005). "Intracellular compartmentation in planctomycetes". Annual Review of Microbiology. 59: 299–328. doi:10.1146/annurev.micro.59.030804.121258. PMID 15910279. ^ Santarella-Mellwig R, Pruggnaller S, Roos N, Mattaj IW & Devos DP (2013). "Three-dimensional reconstruction of bacteria with a complex endomembrane system". PLoS Biology. 11 (5): e1001565. doi:10.1371/journal.pbio.1001565. PMC 3660258. PMID 23700385. ^ Cavalier-Smith T (March 2002). "The phagotrophic origin of eukaryotes and phylogenetic classification of Protozoa". Int. J. Syst. Evol. Microbiol. 52 (Pt 2): 297–354. doi:10.1099/00207713-52-2-297. PMID 11931142. ^ Elizabeth R. Barry, Stephen D. Bell: DNA Replication in the Archaea. In: Microbiol Mol Biol Rev. 2006 Dec; 70(4): 876–887. PMC 1698513. PMID 17158702. doi:10.1128/MMBR.00029-06. ^ Forterre P (2006). "Three RNA cells for ribosomal lineages and three DNA viruses to replicate their genomes: A hypothesis for the origin of cellular domain". PNAS. 103 (10): 3669–3674. Bibcode:2006PNAS..103.3669F. doi:10.1073/pnas.0510333103. PMC 1450140. PMID 16505372.